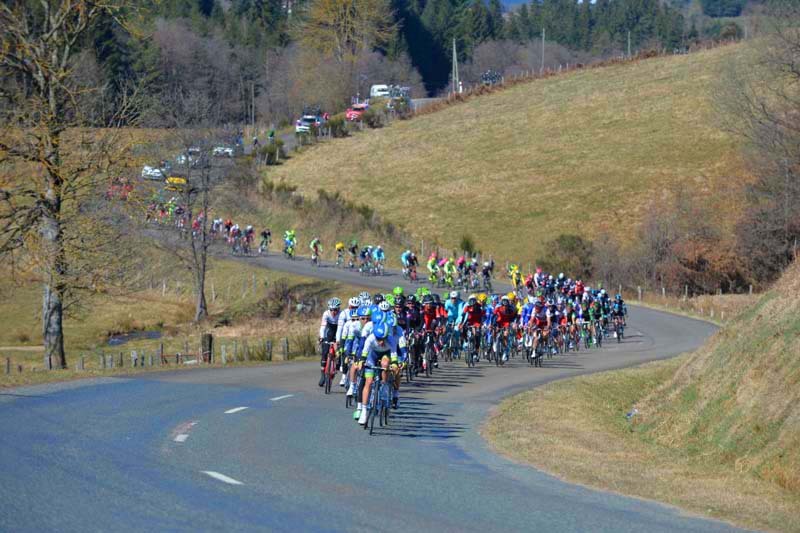 Team Sky were the arch-favourites at the start of this 73rd Paris-Nice and they amply delivered in stage 4 with an impressive one-two at the top of the climb to Croix de Chaubouret on Thursday. Richie Porte, the 2013 winner, won the first major stage of this edition with team-mate Geraint Thomas on his heels, confirming the claim by the British team that they had two cards to play in the Race to the Sun. Yet their efforts in the finale of the longest stage in this edition (204 km) was not quite enough to seize the overall lead as prologue winner Michal Kiwatkowski hung on to take third place and claim the yellow jersey back, leading Porte by the slimmest margin. Thomas is now third, a further two seconds behind. Three men moved on the gun: Thomas De Gendt (Lotto-Soudal), Antoine Duchesne (Team Europcar), quickly joined by Chris Anker Sorensen (Tinkoff-Saxo). The peloton were happy to see them go and their lead increased steadily to reach 8:15 at Km 23. De Gendt made his intentions clear by sweeping the points on the first seven ascents of the day to dislodge Philippe Gilbert from the top of the mountain classification. Duchesne was dropped in the 2nd cat. Cote de la Gimond (km 152). On the descent, AG2R seized their chance to shake off the peloton and raised the tempo, dropping several big names like Bradley Wiggins (Team Sky), Thomas Voeckler (Team Europcar) and several sprinters like Alexander Kristoff (Katusha), Andre Greipel (Lotto-Soudal) or Nace Bouhanni (FDJ). The most serious contender trapped at the back was Poland's Rafal Majka (Tinkoff-Saxo) who suffered a front wheel problem at the worst possible time and had to change bikes twice. De Gendt and Sorensen were caught with 13 kms to go as BMC riders took the reins. At the very start of the final climb, France's Warren Barguil (Team Giant-Alpecin) crashed as Astana and Team Sky took the reins. The British outfit steadily increased the pace, sorting out the leading contenders. While Majka and Bob Jungels (Trek Factory Racing) were among the first to lose ground, yellow jersey holder Michael Matthews (Orica GreenEDGE) faltered with six kilometers to go. 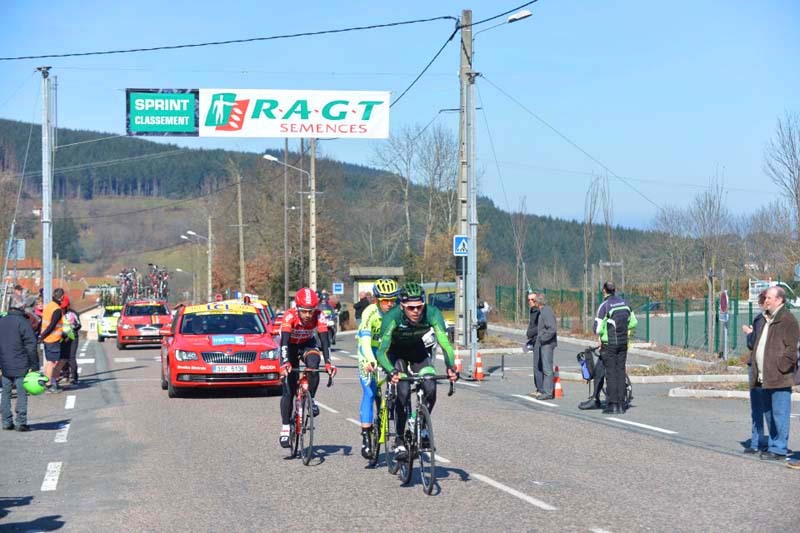 Tony Martin (EQS) and Tom-Jelte Slagter (Team Cannondale-Garmin) were done two kilometres further down the road. Three left for final victory? Once Lars-Petter Nordhaug and Nicholas Roche had finished their team work, Geraint Thomas decided to part company with the rest of the pack three kilometres from the finish line. He was joined by Denmark's Jakob Fuglsang (AST) and Slovenia's Simon Spilak (Katusha). The leading favorites slowly bridged the gap and on the junction, behind the red flame, Richie Porte struck back, taking Thomas with him. This last blow was too much to take for most of the other contenders, except Kwiatkowski. American Tejay Van Garderen is now 27 seconds adrift in fourth overall and Jakob Fuglsang 32 seconds off the pace in fifth. 2 Geraint Thomas (Team Sky) at s.t. 3 Michal Kwiatkowski (Etixx-Quick Step) s.t. 10 Simon Spilak (Team Katusha) all s.t. 12 Gorka Izaguirre Insausti (Movistar Team) s.t. 15 Tom Dumoulin (Team Giant-Alpecin) s.t. 20 Mathias Frank (Iam Cycling) all s.t. 25 Cyril Gautier (Team Europcar) all s.t. 27 Sylvain Chavanel (Iam Cycling) s.t. 30 Robert Kiserlovski (Tinkoff-Saxo) s.t. 34 Eros Capecchi (Movistar Team) s.t. 42 Steven Kruijswijk (Team LottoNL - Jumbo) all s.t. 51 Jonathan Hivert (Bretagne - Seche Environnement) s.t. 57 George Bennett (Team LottoNL - Jumbo) all s.t. 60 Anthony Delaplace (Bretagne - Seche Environnement) both s.t. 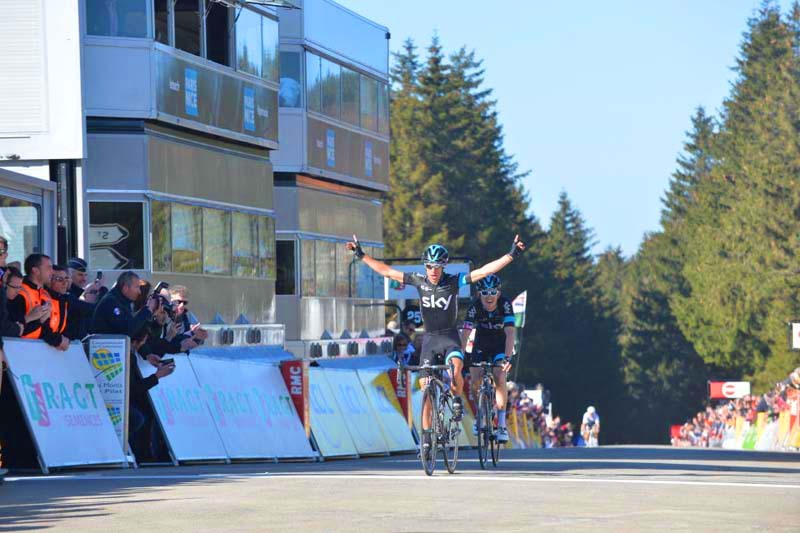 65 Ben Swift (Team Sky) all s.t. 68 Nelson Oliveira (Lampre - Merida) s.t. 76 Arnold Jeannesson (FDJ) all s.t. 78 Michael Matthews (Orica GreenEDGE) s.t. 91 Niccolo Bonifazio (Lampre - Merida) all s.t. 105 Jack Bauer (Team Cannondale-Garmin) all s.t. 151 Alex Howes (Team Cannondale-Garmin) all s.t. 155 Dries Devenyns (Iam Cycling) s.t. 20 Sylvain Chavanel (Iam Cycling) s.t. 107 Arnaud Demare (FDJ) both s.t. 115 Dominique Rollin (Cofidis, Solutions Credits) s.t. 118 Gert Steegmans (Trek Factory Racing) s.t. 124 Nikolas Maes (Etixx-Quick Step) s.t. 133 Sébastien Chavanel (FDJ) s.t.